Uncle Bill's Pet Centers. 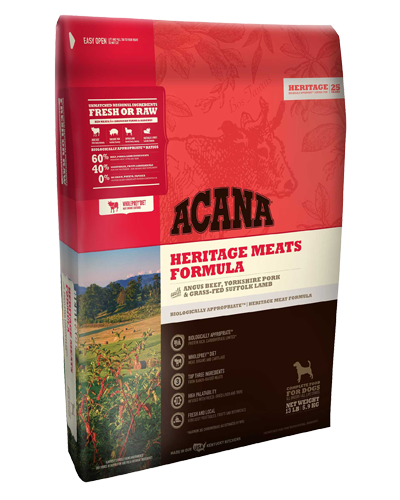 Acana Heritage Grain Free Red Meats - 13 lb. Acana Heritage Grain Free Red Meats - 13 lb. At Uncle Bill’s Pet Center, we not only offer Acana dog food for sale, we also employ a highly trained staff that can assist you in finding an appropriate formula. Your dog evolved as a meat eater. The structure of his teeth, jaws and digestive system scientifically classifies him as a carnivore, evolved for a meat-based diet. That’s why they loaded ACANA Heritage Meats with Angus beef, Yorkshire pork and grass-fed lamb — all raised on local Kentucky farms and delivered fresh, in WholePrey™ ratios of meat, liver, tripe, kidney and cartilage to nourish your dog completely. We will be glad to work with you to ensure that you feed your dog quality food for optimal health and happiness by providing the best selection and value on premium dog food for sale in Indiana. Crude protein (min.) 29 % Fat content (min.) 17 % Crude ash (max.) 9 % Crude fibres (max.) 6 % Moisture (max.) 12 % Calcium (min.) 1.7 % Phosphorus (min.) 1 % Omega-6 fatty acids* (min.) 2.1 % Omega-3 fatty acids* (min.) 0.8 % DHA* (min.) 0.15 % EPA* (min.) 0.15 % Glucosamine* (min.) 600 mg/kg Chondroitin sulfate* (min.) 800 mg/kg Linoleic acid* (min.) 2 % Carbohydrate (NFE) 27 % *not recognized as an essential nutrient by the AAFCO Dog Food Nutrient Profiles.